Many Deaf people are not completely deaf. They might hear certain frequencies, use a hearing aid, and/or read lips. You might not know someone is deaf until she has a reason to tell you. 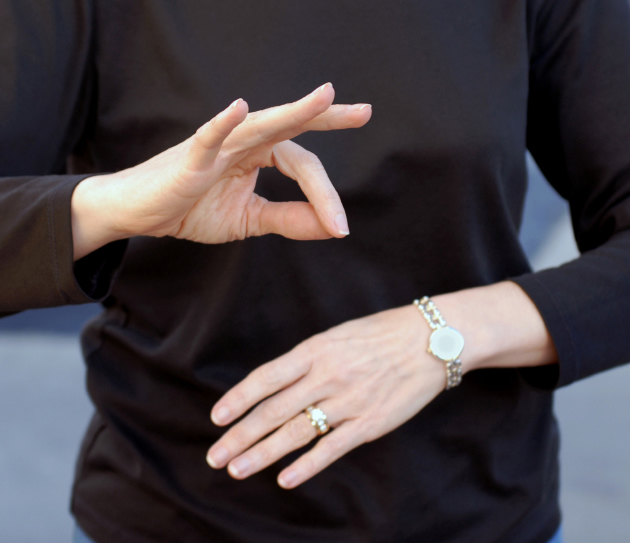 Deaf people are an especially dramatic emerging population, because there are now ways for them to communicate that did not exist before the Internet and wireless technologies came along. Email obviously allows Deaf people to communicate with just about everyone, now. When handheld devices such as the Blackberry came along, they were an instant and huge hit in the Deaf community. The telephone had long been limited in its value, usable only by people who had a TTY-TDD device on each end of the phone line for typing notes to each other (early texting!). Now, by virture of Section 508, the Telecommunications Act, each state provides relay services whereby a deaf person can TTY-TDD with an operator who will voice for them to any call recipient on the other end. It's even possible now for a Deaf person to make a video link with an operator and communicate using American Sign Language (ASL). It is acceptable to touch a Deaf person to get their attention. Do not raise your voice or change your speech. Always interact with person, not with a translator. Choose well lit, quiet settings and keep your mouth visible. Another thing to keep in mind: a Deaf person has a more difficult task in learning to spell if they don't have sounds to associate with letters. Phonics is how most of us learn spelling, so a Deaf person has to go about it differently and it can take a little longer than the norm. Weak spelling is not a reflection of intelligence. Learning the alphabet and numbers with fingerspelling will allow you to have basic communication with a Deaf person. Practice while you wait at red lights! Dark, loud settings make it impossible for a hard-of-hearing person who reads lips and uses hearing aids to communicate. In group conversations, one person at a time should speak — which helps everyone! You are having the conversation with the Deaf person, so look her in the eye and direct your comments to her, unless she chooses to involve the translator. Hearing aids are tuned to normal speech and will distort if you raise your voice. If you attempt to shape your mouth carefully as you speak for lip reading, you will render yourself totally un-understandable. A simple touch on the arm or shoulder is far preferable to jumping up and down and waving your arms to get a Deaf person's attention!